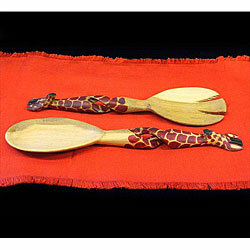 Handmade in Kenya, the salad servers are carved from a single piece of wood. Story Behind the Art: Jedando Modern Handicrafts… A Kenyan organization that works with individual artisans throughout central Kenya who create functional products. Well educated in the characteristics of fair trade, Jedando Modern Handicrafts provides a worldwide market for Kenyan craftspeople who no longer can rely on the tourist market for sustainable income.